herding cats & burning soup: We're SIX Today! Woo! Yall! 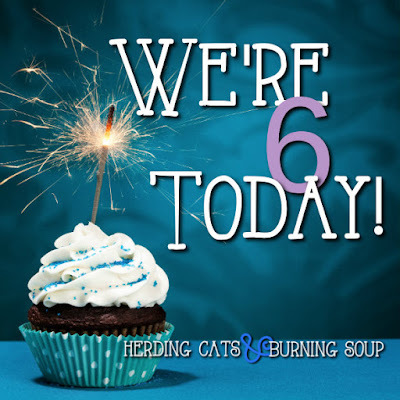 Herding Cats & Burning Soup is....6 today. SIX whole years. I can't believe it's already been 6 years. Today makes post number 2,945! It's been quite a ride. I've met some amazing friends via the blog. Managed to get quoted by a few of the big 5 publishers. Posted over 1,000 reviews, 170 recipes, hosted a few dozen events. Started providing author services and attended a couple book cons. I've tried a lot of different things, kept some of them, changed others. This year I downsized my social media and streamlined by blog posts. I cut out a lot of events and author spotlights. And have done more "just for fun" posts. Taken some time off when my eyes were struggling and joined in on some memes. It's not been a perfect 6 years but they've been pretty damn amazing.